'25 Years, 25 Artists' runs Sept. 5– Oct. 13. A free reception is slated for Thursday, Sept. 5, from 4pm to 6pm. SSU Art Gallery, 1801 E. Cotati Ave., Rohnert Park. 707.664.2295. 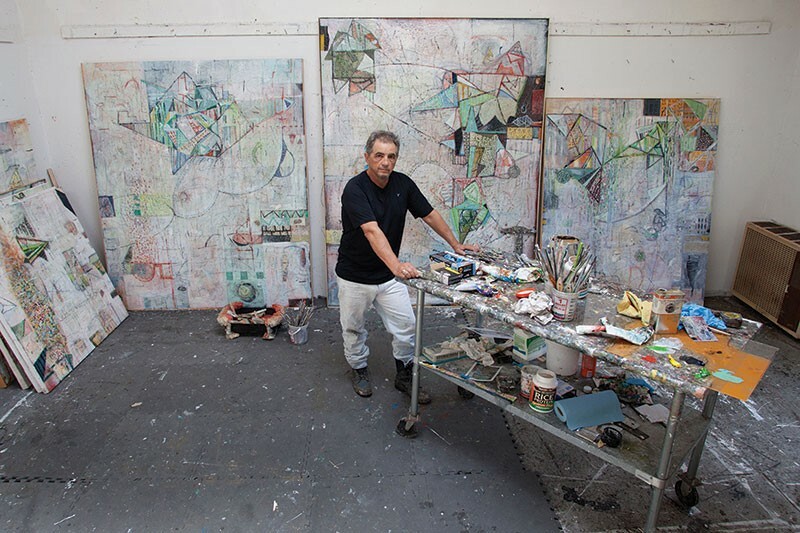 IN THE MOMENT Mark Perlman, who retires this year from SSU with two retrospective shows, pictured in his Sebastopol studio. Entering Mark Perlman's West County home is like entering a small art gallery. His own large, luscious abstract canvases—clothed in the signature encaustic wax that both forbids and beckons examination—hang everywhere. Complemented by delicate sculpture encased in plastic vitrines and serene flower arrangements, there is plenty of work on the walls by former students. Ready to retire this year from full-time duties as an art professor at Sonoma State University, Perlman characteristically celebrates his students rather than his quarter century of service as he dials down his academic life. The result is an exhibit, "25 Years, 25 Artists: The Painting Students of Mark Perlman," opening at the SSU Art Gallery on Thursday, Sept. 5. A one-man homage to his own career follows on Nov. 7. Perlman grimaces briefly when a visitor suggests that this autumn is All Mark All the Time. He'd rather focus on the careers he's helped to foster during his tenure. Thinking over his 25 years at SSU, Perlman tidily chose 25 former students whose dedication and learning arc remain fresh in his memory. "It's a pretty diverse group," Perlman says, settling down in his backyard studio, a barnlike structure bristling with works in progress that bears no resemblance to the tranquility of his home. "It wasn't like I was looking for anything specific. So the work is all over the place: it's realist, it's abstract, it's naïve—and I don't think it's an accident that every one of the 25 were probably the hardest working people who were there. They were there when I got there in the morning, they were there when I left at night. Their commitment pushed that." Not all of them became working artists; Perlman isn't concerned. Rather, he looked for alumni who impressed him with the changes they underwent as they learned. "I remember when some of them first came in and they were among the worst people in the class," he laughs. "They were late for everything and not engaged. And then gradually seeing them grown into adults and become committed was so satisfying." While an undergraduate himself, Perlman was asked by a professor to fill in for two weeks, teaching the class while the teacher mounted an exhibit overseas. Perlman found that what he calls the "translation of ideas" appealed to him enormously. "As I continued in school, I started to really respect my teachers and to see how they were really serious painters and it wasn't just like a day job," he says. "They had these two careers going. The idea of just painting, all day, by myself . . . The social interaction is just really a key element for me. I think I'd go nuts if I had tried to do this and, I don't know, wait tables." It's a safe bet that Perlman would never have to wait tables. His work is collected by a group ranging from the actress Halle Berry to the Hirshhorn Museum in Washington, D.C., to the Gap's corporate offices to those at IBM. Rigorously abstract, Perlman's canvases have an irresistible dynamism to them that encourages the viewer to look and rest and look again. He speaks of the "history of thinking," one he graphs afresh each time. "While I'm painting," he says, "I'm painting the moment, I'm trying to stay in the moment, and whatever is occurring to me is what I want in there. I also don't trust my reaction to the initial marks. Sometimes they look clever or kind of fresh, but I know that I have to have those things historically underneath, and maybe the history will evolve and you'll see the different layers of time as the painting evolves. That's the hope." In fact, Perlman scrapes off almost as much paint as he puts on. "I try to create systems that break down," he says. "Everything seems to work within a system or code, and once I'm in there, I become very bored with the predictability of the system, and so like breaking that system down to see what evolves out of that." Within each frame, Perlman says he weighs beauty against awkwardness against destruction, all within the limits of line, form, composition and hue—the traditional constructs of a painting. "I really like destruction," he smiles. "I like those opposing forces, and I want to seduce myself into loving the painting somehow. Something that's going to draw me or the viewer to it, but once there, I also want enough disturbance or things that aren't working quite right to be presented as a challenge to offset the expectations, the predictability." Encaustic wax, a form of sealing the skin of a work that's been used since the ancient Egyptians, was popularized in the last century by artists Jasper Johns and Brice Marden, but Perlman didn't know what it was. He just liked it. "I started using wax because I really wanted a contradiction between space and surface to be working," he says. "I love surface, I love texture; I also love atmosphere and space, and I thought that I could only have one or another. And then I realized that this wax was transparent but also had a materiality to it, and so I thought I'd start working it into the paint." And while Perlman admired Johns' and Marden's work, he would never emulate it. He encourages his students to do the same. "I've worked really hard to help them to find out who they really are," he says. "What their voice is. It would be such a weird coincidence if their voice were the same as mine. "I understand about apprenticeship, but I really think that since the dawn of the 20th century, it really is about the individual road that you have to travel."